"Buttermilk is beloved in recipes for its ability to make rich, moist cakes. 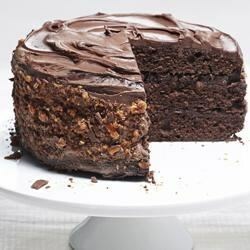 This chocolate buttermilk layer cake uses a variety of your favorite chopped candy bars sprinkled between each layer and as a coating for a sweet, crunchy surprise. This will quickly become a family favorite." Preheat oven to 350 degrees F. Grease bottoms of three 8- or 9-inch-round cake pans; line with a parchment or wax paper circle. Grease parchment, then coat lightly with small amount of cocoa, tapping out excess. Sift flour, cup cocoa, baking soda and salt together into a large bowl. Combine buttermilk, coffee and vanilla extract in small bowl. To assemble: Level (trim tops off) the cakes if desired using a serrated knife. Place a dollop of frosting in the center of a cake pedestal or serving platter so the cake won't slip. Tear four strips of parchment paper and place in a square around the outer 3 inches of pedestal (this will help prevent getting the frosting on the pedestal). Place one cake layer over dollop of frosting. Spread about 1 cup frosting over top; sprinkle top evenly with about 1/4 cup chopped Crunch bar. Top with another cake layer; spread with about 1 cup frosting. Sprinkle with remaining chopped Crunch bar. Top with third cake layer. Cover the top and sides with a thin layer of frosting (this is the "crumb coat"; it doesn't have to be perfect). Refrigerate for 15 minutes, then cover with the remaining frosting. With hands, press chopped Butterfinger around sides of cake. After the frosting has set, gently remove strips of parchment paper. Cut cake into slices for serving. I ended up using Oreos instead and made a four layer cake! It turned out amazing! My mother had a Buttermilk Chocolate Cake when I was a child. This is just like that cake. FANTASTIC!! Everyone loved it. The butterfinger coating was an especially nice touch.